Apple launched its dedicated Photos app for OS X as a developer preview today, and the app marks a clean break from iPhoto in almost every way, with the new software representing a completely new experience from basic code all the way to the user interface. But while it owes a lot to its mobile predecessor, it’s not just a port: The app has some of Aperture’s DNA, and its development team at Apple includes some of the same folks who previously worked on Cupertino’s pro offering. While Photos is definitely aimed at general consumers, and isn’t meant as an Aperture replacement, it does a great job of reflecting the maturation of the general photographer – taking pictures was, at its outset, a hobby reserved for the wealthy and patient, has become so prevalent that if you were to hear about someone who simply didn’t take photos, you’d probably think they were at least a little weird. Ubiquitous photography means consumers will naturally want to go beyond just baseline with their picture-taking, and Photos reflects that. Photos was designed with cross-platform user experiences in mind, so that the desktop app has a lot of similarities to the iOS version in terms of look and feel, and in terms of basic editing tools. Part of the engineering team behind it also built the iOS app, which is part of Apple’s larger strategy with third-party developers and Swift, too. But despite its initial similarities, it’s designed to maximize the benefit of the additional screen real estate you’ll get on a Mac, and you get more advanced editing tools plus features that take advantage of the Mac’s higher horsepower. A central concept behind Photos on the Mac is to make libraries easily accessible no matter where a user wants to get at them. That’s why it works hand-in-hand with iCloud Photo Library, which is available in beta now on iOS (and on Mac for developers as of today). This is part of the reason why Apple didn’t just do another major point upgrade for iPhoto, and instead decided to start anew. Apple also recognized that while iPhoto had its time in the sun, that time had passed, with users growing disaffected with its sluggishness, especially with larger library sizes. A fresh start also enabled development of a Photos app designed specifically for speed and scale. Not only has the widespread availability of quality cameras on smartphones made more people take up photography, it also means they take a lot more photos than they did back in the days when iPhoto was first created. Editing is also a big change that Apple focused on with this new software. The smart sliders they’ve built will be familiar to those who’ve used the editing features on their iPhone or iPad. These editing features incorporate a lot of the tweaking made possible with Aperture, but Apple has created sophisticated algorithms that allow a single slider to control as many as six individual sliders at once, reducing complexity while producing results that most probably couldn’t replicate on their own with more granular manual adjustments. Apple wasn’t looking to replace Aperture with Photos, but it has brought the best parts of that software’s editing features to an app that makes them far more accessible to the average user. Plus, if you’re an expert, Apple made sure it was possible to drill down for fine-grained control. Apple made sure that those who shoot RAW are well-served by Photos, and they even added some more advanced editing features that go beyond what Aperture could offer, which include advanced black and white editing tools for getting that high-quality noir look. The thing that’s missing for now are the workflow tools that let users split libraries and sort via star ratings, but Apple’s current version of Photos is a 1.0 release, and there are ample plans in place for potential future additions. It’s very possible that as everyday photographers get even more comfortable with professional-level tools, they’ll get baked in to Photos along the way. 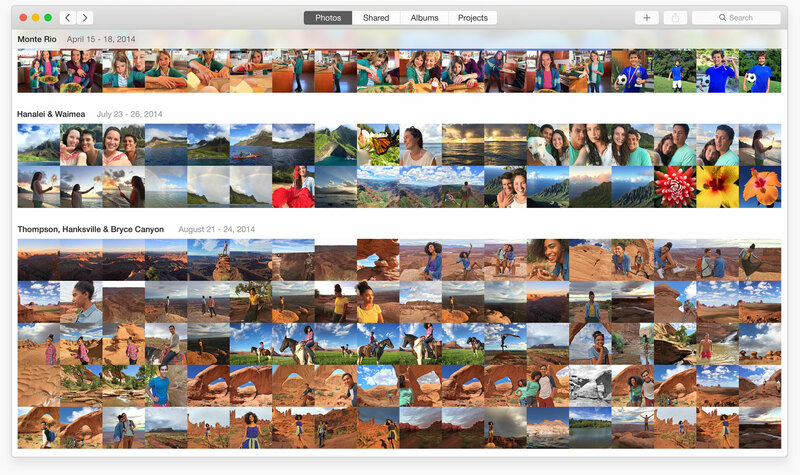 In some ways, Photos represents a considerable shift in the way Apple thinks about software experiences. More so than most other apps, it’s less about distinct products for every platform, and more about pushing Photos as a singular experience that’s available no matter how users want to access it – be it on iOS, on Mac, or on the web. Photos is a holistic activity that takes place across Apple’s hardware offerings (and beyond), and provided it works well for users, you can probably expect more of an approach where software experiences become transcendent of the different gadgets they call home. Each will still have strengths and features that change depending on where a user chooses to access them, but selling the experience reinforces the value of immersing yourself completely in an ecosystem, so unified product messaging is a natural end point.